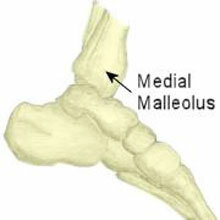 The medial malleolus is the bony bit on the inside of the ankle. A stress fracture of the medial malleolus can occur but is very rare. It causes pain on the inside of the ankle which is exacerbated by activity. Symptoms of a medial malleolus stress fracture will include pain on the inside of the ankle which is made worse by running and jumping activities. There will be specific point tenderness over the medial malleolus or bony part on the inside of the ankle. There may also be swelling seen but not in all cases. If the stress fracture is in the early stages it may not show up on X-ray but a bone scan, CT scan or MRI can confirm the diagnosis. Treatment is basically resting from weight-bearing activities for around 6 weeks. An ankle brace or support may help protect and support the joint. If the injury has progressed to a complete fracture then surgery will most likely be required. After a period of rest then ankle strengthening and proprioception exercises should be done to restore full strength and coordination to the ankle joint preventing future injuries. It is also important to identify the cause of the stress fracture in the first place. This may be due to overtraining, poor technique or poor foot biomechanics. A podiatrist or sports injury professional may prescribe orthotic insoles to correct any biomechanical problems of the foot. Specialist sports coaches should be consulted if training errors are suspected to have contributed to the injury.